I love steak and especially a steak that isn't overly done up. I've seen restaurants offer special sauces to accompany steaks for an extra touch but in my mind, good steaks don't need anything else besides salt and pepper. With that in mind, these steaks don't rely on anything else. The only special touch, which is really optional, is the fresh herb butter. It's served on top of the steak for just a subtle richness and flavor but probably goes better with the bed of potatoes the steak is served with. The herb butter is great to have on hand to use in other recipes as an added touch but it really does add something nice to the steak. Place potatoes on a large baking sheet and drizzle with 1 tablespoon olive oil. Roast in preheated oven for 20 minutes, turning halfway through. While the potatoes roast, in a small bowl, combine the zest, 1 1/2 tablespoons chopped basil and 1 tablespoon salt. Mix using your fingers. Sprinkle mixture over the roast potatoes after 20 minutes and continue roasting for 5 more minutes. Remove potatoes from oven and keep warm. Combine the remaining basil, parsley and chives with the butter. Season with salt to taste. Using a for, mash butter together with the herbs and combine well. Set aside. Heat 2 tablespoons olive oil in a large heavy skillet over medium heat. Pat the steaks dry with a paper towel and season both sides generously with salt and pepper. add steaks to pan and cook until well browned, about 4 minutes per side. Transfer steaks to a serving plate and cover with foil to keep warm. Set aside to rest for 5-10 minutes. 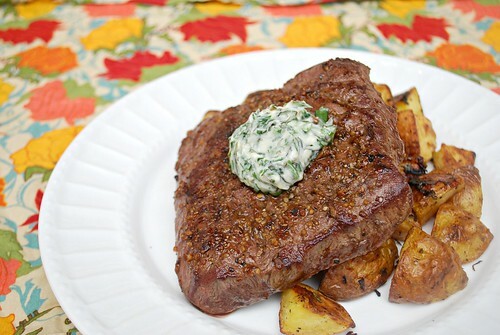 Top each steak with 1 tablespoon herb butter and serve with citrus potatoes. OH I love herbed butter on steak! We had that all the time in Germany. Miss it like crazy! Will have to try this next time we make steak! Oooooooh, wow! That looks so delicious! 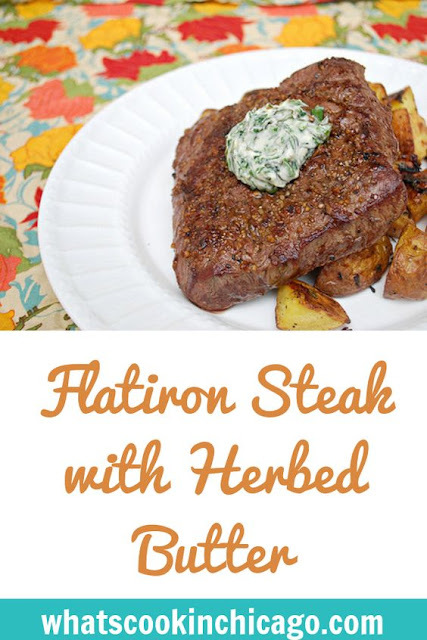 Okay, I've got to try that herb butter the next time we make steaks, looks great. I think we'll have steaks for dinner now. that looks delicious and a great finishing touch on steak! I;m about ready for another weekend right now - and it's Monday! That looks delish!! Thanks for sharing. This looks so unbelievably good!!! I want to try it now! I have been looking for a good recipe for a steak, and this one tops the list! There's nothing like steak with butter on it... so juicy, decadent!